Thankfully, in our household, we do have some comfort meals that are a cinch to make. And when I say a dish is easy to make, I really mean EASY with all the caps it deserves. 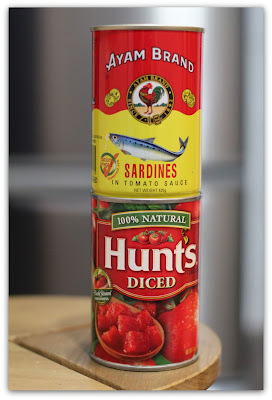 We always have cans of sardines (in tomato sauce) and diced tomatoes in our kitchen. Eat with warm rice and enjoy the tantalising mix of sweet, salty, sour and spicy flavours. Mmm mmm. Hey, I do the same too! :) We stock up on loads of Hunt's but we use the whole plum tomatoes. And its chilli tuna for us, with more chilli padi, and toss with pasta! :) Thanks for sharing, might try sardines the next round! It's 1230a.m and I'm STARVING after reading your post. I love Hunt's! Thanks for sharing your version of this too. When I'm too tired though, rice is always easier than pasta. I just let the rice cooker do its thing :) I sometimes also do cold pasta with tuna (in oil), chopped tomatoes and mayo. Hope you got a food fix! I always get hungry too if I am up beyond midnight. Haha, good for you! That's my downfall. I am totally not a bread/pastry person. My sister could live on sandwiches but not me. I was so annoying to even want hot meals when we were travelling in Sweden/Denmark together!